Complex multicellular life evolved from a symbiotic relationship with mitochondria. As a result, several regulatory processes within the cell and the organism − from differentiation to death − are influenced by mitochondrial signals. Not unlike their bacterial ancestors, mitochondria also exchange molecular information and communicate with each other. This occurs through organelle fusion, mitochondrial nanotunnels, physical connections called inter-mitochondrial junctions (IMJs), and soluble molecules. 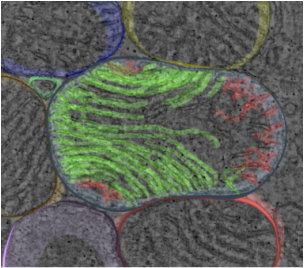 Together, mitochondria are thought to form a functional network within the cell cytoplasm. By understanding the behavior, language, and function of individual mitochondria, and especially their interactions with each other, we aim to understand principles that inform the function of mitochondrial networks, and their role the regulation of individual cells, and of the whole organism. "The organism is integrated into a larger system of information exchange […]. The brain and the rest of the organism are not qualitatively different in their ability to compute ​information,​ but show only qualitative differences in their purposiveness."